Fulvio Stel is a reasearcher at ARPA-OSMER, Palmanova, CRMA – Regional Center for Environmental Modeling. Former President of Friuli Venezia Giulia Meteorological Society (UMFVG), Fulvio is currently employed at the Regional Environmental Agency. He worked as a forecaster for some ten years, carrying out research in the field of severe weather events and recently turned his interests to the topic of environmental modelling, in particular air pollution. Fulvio is a co-founder of the European Severe Storm Laboratory (ESSL) and the European Severe Weather Database programme (ESWD). Since 2004 he has been acting as convenor for the EMS Annual Meeting sessions on atmospheric hazards and severe weather. 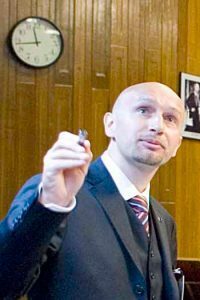 He is an Associated Editor of Atmospheric Research and a contract professor and member of a Fluid Mechanics PhD programme at the Atmospheric Physics department at the University of Trieste.